Mother’s Day is arriving soon and what better way to teach our youngsters about how special mothers are than to teach them about the mothers in the Bible. For some young children it is difficult to understand that people in the Bible were real and that they were babies at one point. I have put together these readers for the children in our classes who are learning how to read. I have separated the words into word parts to help them be able to read the words easier and with more confidence. You can print out a copy for each of the children in your class who you think would like to take it home to practice their reading as well as share the story with others at home. This series on mothers will hopefully open their eyes to some of the wonderful mothers that were written about in God’s Word. Here is the list of the mothers in this mother’s of the Bible series. This reader (#5) is about Jochebed & the Pharaoh’s Daughter. I have put these two together, because Moses was raised by them both. 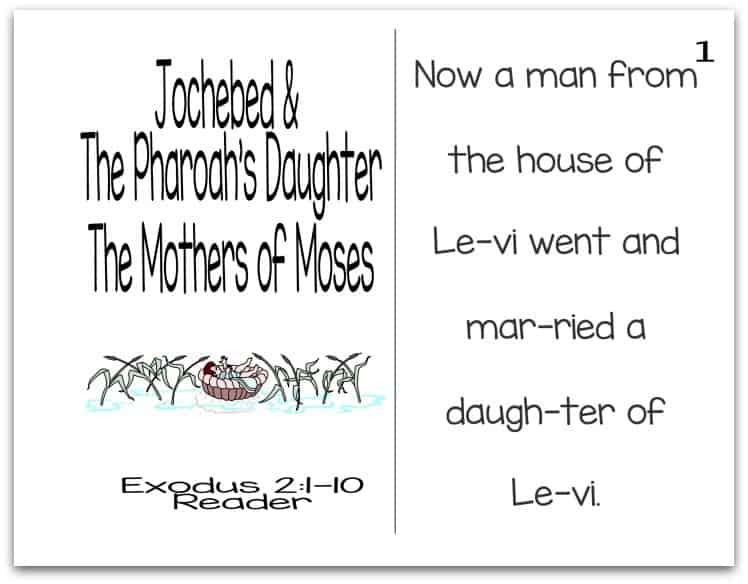 Jochebed was Moses’ birth mother and the Pharaoh’s daughter was his adopted mother. Tony Kummer (Editor) reviewed & updated this page on : April 27, 2016 at 5:13 pm. All our content is peer reviewed by our readers, simply leave a comment on any post suggest an update.